BREAKING: Facebook Business, the marketing and advertisement creation platform for ads on Facebook, has just announced that they will now be offering Split Testing in ads, apart from the traditional A/B testing that has been important for marketers in the past to understand which of their ads perform best. So, what is split testing? According to Facebook, split testing will help "advertisers understand how different aspects of their ads affect campaign performance". Like A/B testing comparing two different advertisements (whether it be different copy or a different image), split testing lets the business manager test one singular ad, but with different human variables (like audience or placement). For example, you could be showing the same ad to women ages 25-37, and to men ages 40-55, and will be able to analyze and interpret which audience responded best to the ad. Pretty cool, huh? 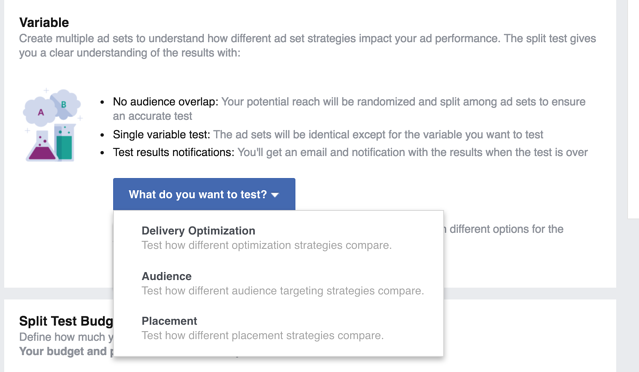 You could also test your delivery optimization (pay per click versus pay for impressions), or your ad placement (in news feed, right column, etc) — but not all at the same time. Split Testing will divide your audiences into random, non-overlapping groups and will show the exact same advertisement. (This ensures the test is conducted fairly so other factors will not skew the results of the comparison between the groups). Each ad set will have only one distinct variable, such as audience type, delivery optimization, or placement. Then, Facebook will only chance the single variable of your choice. Unlike other advertisements, Split Testing is based on real people, not HTTP cookies, thus they can be gathered across multiple different devices, as well. Each ad's performance is measured by the campaign's objective, and is then both recorded and compared. From there, the best performing ad set "wins". After a winning advertisement is declared, you will get a notification inside your Facebook Business Manager account and in your email containing the results of the split testing. Facebook hopes that this new way of advertising on the platform will allow you to gain new insights for your company, fueling your future ad strategies on Facebook for your campaigns in the future. Thinking about upping your social media game? We’re an inbound marketing agency that has experience rolling out social media advertising campaigns. Contact us today.